An andiron or firedog, fire-dog or fire dog is a bracket support, normally found in pairs, on which logs are laid for burning in an open fireplace, so that air may circulate under the firewood, allowing better burning and less smoke. They generally consist of a tall vertical element at the front, with at least two legs. This stops the logs from rolling out into the room, and may be highly decorative. The other element is one or more low horizontal pieces stretching back and serving to hold the logs off the bottom of the fireplace. Iron was the natural material for andirons, but from the Renaissance onwards the front vertical element was increasingly given decorative treatment, and was in a different metal, such as brass, bronze or silver, which allowed casting, hugely increasing the range of decorative possibilities. Andirons, with firebacks, were one of the first types of object to be commonly made in cast iron, which in England began in the 1540s. Until the 19th century cast iron was too brittle for many uses, but andirons carried little loads and this was not a problem. From the 18th century fireplaces increasingly had built-in metal grates to hold the firewood, or the coal now increasingly used, up off the floor and in place, thus largely removing the need for andirons. However they were often still kept, for decorative reasons, and sometimes as a place to rest pokers, tongs and other fire implements. They are sometimes called a dog or dog-iron. In older periods andirons were used as a rest for a roasting spit; and sometimes included a cup-shaped top to hold porridge. 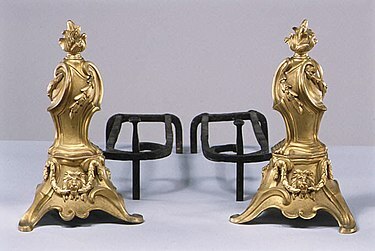 Sometimes, smaller pairs were placed between the main andirons for smaller fires. These are called "creepers". Andirons and fire dogs are devices made of metal and (rarely) ceramic which support the firewood. They normally stand upon short legs and are usually connected with an upright guard. The guard keeps the logs in the fireplace as they burn and settle. This guard, which may be of iron, steel, copper, bronze, or silver, may be simple, or elaborately ornamented (often with patterns or heraldic ornaments, such as the fleur-de-lis, with sphinxes, grotesque animals, mythological statuettes, or caryatides supporting heroic figures or emblems). A common decoration in the form of a canine plays on the dual meanings of the word dog (canine and inanimate holder or blocker). Andirons, or fire dogs, had been in use by the Ancient Greeks, and were called krateutai (Greek: κρατευταί). Excavations made on the Greek island of Santorini, unearthed stone sets of firedogs used before the 17th century BC. In each pair of the supports, the receptacles to hold skewers or spits were found in equivalence, while the line of small openings in the base formed a mechanism to supply the coals with oxygen so that they remained alight during its use. Fire dogs were also referred to as moon idols (or moon horns) in antiquity. They may also refer to an artifact-type of late Bronze Age Europe (c. 1300 to 800 BC). Typically made of clay, they have been found in areas of modern France, Switzerland and Germany; often associated with the Urnfield culture. This naming suggests that moon idols could have been used as andirons to build up fire dogs. In some cases, moon idols are a cult item of Early European Religions, resembling a pair of horns or crescent moons on a pedestal, and were variously interpreted as testifying to Bull worship, Moon worship, or as a holder for wooden logs to be used in a fire altar. Medieval andirons tended to be high, often with slots at the front for placing spits for roasting; in later periods similar styles remained in use in large kitchens. When the Italian Renaissance began to produce very elaborate decorated fronts for reception rooms, these remained higher than later, gradually tending to reduce in height until the 18th century. Before the Renaissance, andirons were almost invariably made entirely of iron and were of comparatively plain design, but when metals that could be cast began to be used for at least the fronts, these ordinary objects of the household received the attention of the artist, and had skill and taste lavished upon them. Men such as Jean Berain, whose artistry was most especially applied to the ornamentation of Boulle furniture, sometimes designed them. The Algardi Firedogs commissioned from the Roman sculptor Alessandro Algardi for Philip IV of Spain by Velasquez in 1650 were copied in several foundries. The andiron reached its greatest artistic development under Louis XIV of France. Firedogs, with little or no ornamentation and made of metal or ceramics, were used in kitchens, with ratcheted uprights for the spits. Very often these uprights branched out into arms, or hobs, for stewing or keeping food hot. English late 17th-century andirons often have elaborate flat brass front pieces, often in openwork and sometimes using enamel for further decoration. By the 18th century classical forms with several mouldings, similar to those used for candlesticks and the like, predominate in pieces for the middle classes, and were followed in the American colonies, often just in iron and rather more simply. Small figures at the front also became popular; in America cast flat "Hessian" soldiers were a long-lasting favourite. One or more of the preceding sentences incorporates text from a publication now in the public domain: Chisholm, Hugh, ed. (1911). "Andiron" . Encyclopædia Britannica. 1 (11th ed.). Cambridge University Press. p. 965. ^ To Vima (in Greek)]; 6-2-2011; picture 2. ^ Fireplace Andirons from Fireplaces Magazine. 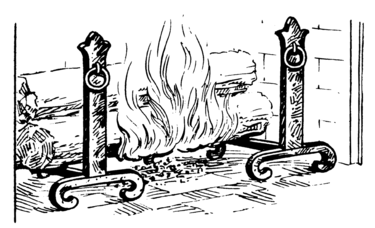 Wikimedia Commons has media related to Fireplace andirons.